Shield worlds, also known simply as Shields, are Forerunner installations designed as a defensive strategy against the Flood and an alternative to the Halo Array. As opposed to sterilizing the whole galaxy at once, shield worlds would act as a more precise and conventional solution, serving as both refuges for local populations and powerful military fortresses from which to carry out strategic campaigns against the Flood. Several varieties of shield worlds were designed over nearly nine thousand years; in some iterations the interior was suspended in fractal slipspace, protecting organisms within from the Halos' destructive pulse. A prevalent variation of the shield world concept, known as the conservation sphere, was specifically designed in tandem with the Conservation Measure, sheltering various evacuated species from the Halo effect. Scattered across the Forerunner ecumene, the shield worlds outnumber the Halos by a large margin, with over a thousand installations originally planned and at least 673 constructed, assuming their numeric designations were assigned sequentially. In the final iteration of the Forerunners' defense plan, the shield worlds were collectively known as "Shields" while the Halos were known as "the Sword". Shield worlds were used by the Warrior-Servants as military outposts for thousands of years before the Forerunner-Flood war. The first shield world, the Prometheans' military operations hub known as Requiem, was constructed long before the human-Forerunner wars in 107,445 BCE. After the Forerunners learned of the parasite known as the Flood in the later stages of the war with the humans, the Didact began to champion the construction of more shield worlds as part of his star-hopping strategy. Many shield worlds were planned to be mobile, able to be deployed directly into infected systems to purge local infestations, and would be designed as facilities from which to fight and research the Flood, an alternate solution to Master Builder Faber's plan to construct the Halos. Eventually, a compromise between the two rates was reached: the Builders would continue building shield worlds while designing the Halos, with both types of installations planned to be used in tandem. Numerous shield worlds of different configurations were built over thousands of years, but the Builder rate's growing influence eventually led the Old Council to deem the Master Builder's Halo project superior. The Didact, who stubbornly continued to advocate his strategy to the Council, was ultimately ordered to cease his project and was forced into exile. Though the construction of the shield worlds was abandoned after the Didact's exile, they still found use as shelters for the various species the Lifeworkers indexed and collected in the Conservation Measure. Many Forerunners also intended to evacuate to the shield worlds, but the betrayal by the Forerunners' supreme defense AI Mendicant Bias and its defection to the Flood forced the Forerunners to abandon these plans: Mendicant Bias revealed the locations of the shield worlds to the Flood. The Covenant owe much of their rapid technological advancement to the discovery of a small number of shield worlds early in their history. They stripped these installations of usable technologies, though whether they continued to inhabit them is unclear. During the Human-Covenant War, the shield worlds began to be discovered by humanity, starting with the Etran Harborage in 2531. The shield world Onyx's internal Dyson shell, Sarcophagus, was rediscovered in 2552 and Requiem in 2557. Both the Etran Harborage and Requiem were ultimately destroyed, but Sarcophagus became home to a joint UNSC-Sangheili research effort and colony. Requiem was the first shield world to be constructed, its design later serving as the template for the entire concept. This variant features an entirely artificial, heavily armored outer surface and contains a number of concentric miniature Dyson shells within its outer shell. Like the exterior, the interior surface of the outer shell is mechanized, and features a light source for warmth and illumination. Another sphere, containing a terrestrial surface oriented similarly to a planet, is located below the outer shell. The interior of this shell contains the hollow core of the shield world and a Dyson shell-like inverted surface. Requiem apparently lacked shielding from the Halo effect in spite of being the most fortified shield world in existence. Whether this is true of the Refuge, which used a scaled-down version of Requiem's planet-within-shell design, is unclear. A holographic diagram of the Etran Harborage. A common iteration of the shield world concept, the conservation sphere consists of an artificial planetary surface encapsulating a miniature Dyson sphere. Beneath the artificial planetary surface span kilometers of machinery, including many access portals which lead to the sphere's interior; these portals remain sealed when not in use. The interior of the installation is hollow and features a vast terraformed surface and a miniature artificial star. At least one such installation, the Etran Harborage, had an interior diameter of 2,873 kilometers (1,787 miles). While these installations provide safety from the firing of the Halo Array, many possess weapons that can be used to defend the installation's inhabitants; some even harbor fleets of dreadnoughts. These defenses can be activated from an installation's control room or equivalent control center, which sometimes takes the form of an airborne platform. However, the control center must be activated by a human: a Reclaimer. Certain planets are home to conservation sphere waystations, stellar cartographers housing directions to nearby conservation spheres. One such facility was located on the human colony world of Harvest. The main component of this type of shield world is a Dyson sphere located within a bubble of compressed Slipstream space. The only entrance to the interior is a small portal within the core of an artificial planet built around the core. Access to these shield worlds is possible only upon the imminent activation of the Halo Array. The Dyson sphere within this type of shield world is enormous; Shield World 006, for example, is two astronomical units (300 million kilometers) in diameter. As with the more common conservation spheres, micro Dyson sphere-type shield worlds feature vast terraformed surfaces and a single artificial star. The inner Dyson sphere resides within a slipspace bubble and is thus accessible only from the core room antechamber in the heart of the artificial planet formed around the structure. In normal space, the slipspace bubble is radically smaller than the interior, being only a few meters in diameter, hence the moniker "micro Dyson sphere". Shield World 0001 (commonly known as Requiem) is the oldest shield world as well as the most heavily fortified. It was built long before the human-Forerunner wars and served as a template for the construction of the other shield worlds. Requiem once served as the nexus of operations for the Promethean class of Warrior-Servants but was sealed off shortly before the end of the Forerunner-Flood war. John-117 and Cortana found themselves on Requiem in July 2557, where they encountered Jul 'Mdama's Covenant, the occupying Prometheans, and eventually the crew of UNSC Infinity. John accidentally released the Didact from his imprisonment in Requiem's core; after helping Infinity escape the Spartan attempted to stop the Forerunner from acquiring the device known as the Composer. The Didact escaped in his ship Mantle's Approach but the two successfully pursued him. Six months later, in February 2558, the UNSC, the Covenant, and the Promethean forces returned to fight for control of the shield world, which ended when Jul 'Mdama put Requiem on a collision course with its star, destroying both bodies. Shield World 006 (designated "ONI Research Facility Trevelyan" by the UNSC) is a Dyson sphere formerly housed within a slipspace bubble of compressed dimensionality, having a diameter of only 23 centimeters in normal space. The slipspace bubble was located in the center of the artificial planet Onyx before the planet dissolved and the slipspace rift was deactivated. The sphere itself is approximately two astronomical units (300 million kilometers) in diameter and weighs approximately 1.37 solar masses. The Dyson sphere's default environmental conditions are suitable for Earth-based life but the climate settings can be adjusted for other species' requirements. When Onyx was intact, the only means of access to Shield World 006 was a small portal, which was located inside a massive antechamber in the core of the artificial planet. Near the end of the Onyx Conflict on November 3, 2552, Covenant Fleet Master Voro Nar 'Mantakree led his forces in an attempt to access Shield World 006. However, Spartan Kurt Ambrose detonated a pair of FENRIS nuclear warheads within the core room antechamber after his comrades had passed through the portal, denying the Covenant access. The human survivors, including Spartan-II Blue Team, several Spartan-IIIs, Dr. Catherine Halsey, and Senior Chief Petty Officer Franklin Mendez, were then trapped within the shield world. Shortly thereafter, the installation's Sentinels destroyed the artificial surface of Onyx. After spending several days in the sphere — over three months in normal space-time — the survivors encountered a population of Huragok which had been left behind to maintain the sphere. They eventually managed to convince the Huragok into transitioning the shield world into normal space. Soon after, the Office of Naval Intelligence made the installation into a research facility in order to acquire the Forerunner technologies housed there. With the outbreak of the Created conflict, the residents of the shield world had it returned to slipspace to act as a measure of protection against Cortana and her Created servants. Shield World 0459 (formally known as the Etran Harborage; original name loosely translated as Trove) was a standard conservation sphere: a hollow construct with a terraformed surface and an artificial star, surrounded by an artificial planetary shell. The interior of this construct could be accessed through one of the numerous access tunnels located around the surface. Like many shield worlds, Shield 0459 harbored a fleet of Sojourner-class dreadnoughts for defense of its inhabitants. At some point, much of the planet's surface had been consumed by the Flood, giving it a barren, desert appearance. During the campaign on the installation in February 2531, the crew of the UNSC Spirit of Fire encountered the Flood on the surface of and later within the shield world. Upon rescuing Professor Ellen Anders, whom Arbiter Ripa 'Moramee had captured in order to activate the installation's fleet of Forerunner dreadnoughts, the crew realized the danger this fleet could pose to humanity. Thus, they decided to sacrifice Spirit of Fire's slipspace drive, causing a supernova within the shield world's artificial star and destroying the vessels. This plan was successful: Shield 0459 was pulverized by the ensuing explosion, the dreadnoughts were destroyed, and all the Covenant forces and Flood forms on the installation were killed. In 2557, the debris field from the installation was rediscovered by the Ace of Spades, captained by Rion Forge, daughter of Sergeant John Forge who had destroyed it in the first place. The crew was able to recover Little Bit, a fragment of the installation's AI. After being captured by ONI, the crew had Little Bit stolen from them along with all of their data and personal possessions. After a mission to the system encountered a Covenant battlegroup led by Gek 'Lhar, the UNSC sent a massive fleet to the system that launched a nuclear bombardment against the debris field. The bombardment blew the remains of the installation to bits and disrupted its orbit around the Korinth Prior system's dwarf star. Anything that survived would most likely fall into the star's gravity and be destroyed, completely eradicating the shield world and keeping it out of enemy hands. Shield World 0673 (renamed "the Refuge" by the Ussans) was another unique type of shield world and possibly the last shield installation to be constructed. Like Requiem it housed a terrestrial environment protected by a metallic shell. Overseen by the monitor Enduring Bias, the shield world's most extraordinary feature was its ability to break its outer shell apart and disperse the components across the asteroid belt of the system in the event the interior was compromised. In the Covenant's early years Ussa 'Xellus, the leader of a Sangheili resistance movement against the Covenant, used the shield world as a refuge for his followers until they could gather enough strength to strike against the Covenant. The Ussan faction remained in the shield world, which they named the Refuge, for thousands of years until their rediscovery by Covenant fleeing the Great Schism in 2553. Shield World 10021 served as an archive for the Juridical rate. This shield world was located in the Orion Spur of the Milky Way. Cortana's line in the Halo 3 announcement trailer, "I am your shield. I am your sword," echoes the Forerunners' reference to the shield worlds as "the Shield" and the Halos as "the Sword". Bastion is potentially a shield world, as it is identified as "Shield World 0983" in a cut line of dialogue from Halo 5: Guardians. The fully mechanized surface of Requiem in Halo 3. 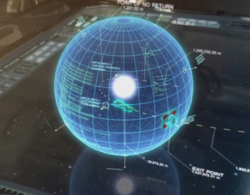 The Etran Harborage's artificial planetary surface in Halo Wars. Spirit of Fire hovering over a barren landscape on the Etran Harborage. Spirit of Fire inside one of the Etran Harborage's access tunnels. Structures in the Etran Harborage's interior. Onyx, the artificial planet that concealed Shield World 006, in Birth of a Spartan. Requiem with one of its entrance portals open in Halo 4. Shield World 0673 disassembling itself in Halo: Broken Circle.